A 110V AC or 12V DC electric fence energizer kit used to contain poultry, cattle, sheep, goats, horses and guard dogs. Effective against predators. Made by Horizont, the German company whose products we have sold and used for 15 years. A 110v AC or 12v DC electric fence energizer used to keep out deer, raccoons and rabbits from garden/orchard areas. It is also used to keep in poultry, cattle, sheep, goats, horses, and guard dogs. Effective at protecting against coyotes, stray dogs, bear and fox. 12v DC draw: 46 mA/hr. With this energizer a 12v 100 ampere hour, deep cycle battery will last approximately 54 days* on a clean or a weedy fence. *Assumes being drawn down to 40% between recharges. Includes: 12v battery leads, 110v adapter and wiring harness. Should power 1 mile of 3 strand cattle fence, 1/2 mile of a 5-7 strand sheep fence, 6 of the 164' sheep/goat nets and 3 of the 164' poultry nets. All distances are dependent on amount of grass/weed load on the fence. 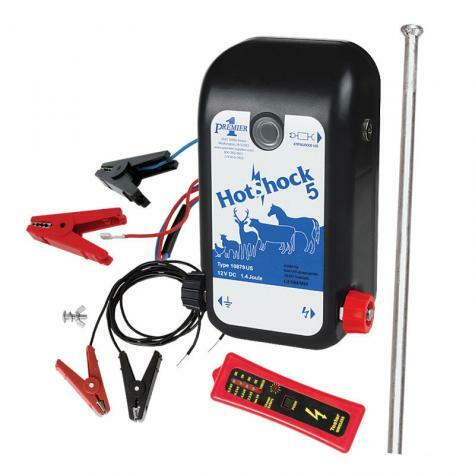 HotShock 5: Versatile, can be used as a plug-in energizer or as a battery energizer. Adapts from one style to the other in a few seconds. Easily moved around. Low cost. 5-Light Tester: Low cost way to make sure you have enough volts on the fence to keep animals in and predators out. The energizer can be mounted either inside or outside of a building or on the modified ground rod that comes with the kit. Make sure that there is no risk of fire wherever you decide to locate it. The energizer must be mounted vertically. Protect the energizer from direct rainfall or flooding. Plug 12v battery leads into bottom of energizer. Attach red clip to positive terminal on battery. Attach black clip to negative terminal on battery. From the Wiring Harness, connect black lead's bare wire end to ground terminal and clip other end of lead to ground rod. Test fence with 5 Light Fence Tester. Allow 3 ft of rod per joule of energy released. Use multiple 6 ft rods for large energizers and 3 ft rods for smaller energizers (and lightning diverters). Make sure to put the ground rod all the way into the ground. Clip black clip onto ground rod. Make sure the energizer is unplugged before working on the fence or the energizer. When using a 12v deep cycle battery, there is no case to protect the battery, so the battery will be exposed to the elements and risk of theft. This unit is not modular, therefore it is not repairable. Ground rod: When installing more than one ground rod, space the ground rods apart 2 feet longer than the rod. Example 3' rods should be spaced 6' apart. 5-Light Tester: Make sure that the probe has not become separated from the black insulated wire. Cup your hands around the body of the tester to keep the sun's glare off the lights of the tester. Ground Rod: If you are not getting a good reading on your fence: Make sure to have the ground rod all the way into the ground. Make sure you have a good connection to the ground rod. Make sure to have a good connection on the energizer and fence. Works as advertized and the kit has everything I needed to set up a solid, safe electro-fence to keep poultry in, and the dogs out. I am very happy with the product and the delivery. P.S. It would has been nice to have more instruction on how to connect leads to fence and ground. We are very pleased with this kit. It works with our E'Stop 9/42/6 electric net. It has powered the net and kept our goats in and our neighbors dogs out. It has worked as we expected. Shipping was fast. Works wonderfully and the kit has everything I needed to set up a solid, safe electro-fence for my poultry. We are very happy with the product and the delivery.